Last week, after much anticipation, SCS was able to get the Young Growth bike shelter installed at the Sitka Sound Science Center. If you haven’t had a chance to check it out, we encourage you to do so. It’s the product of multiple community partnerships and hard work. 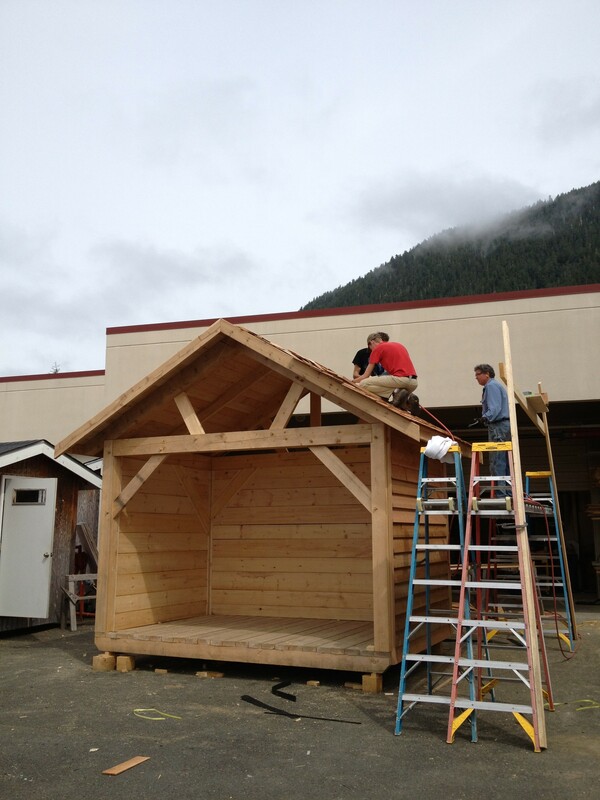 This summer SCS produced a video about the bike shelter and it features time lapse footage of the shelter going up and an interview with Randy Hughey, the instructor at Sitka High who designed the shelter along with local craftsman Dan Sheehan. We can’t thank all of these great people enough for their help with this project! Sam Scotchmer and Pete Weiland during installation of the red alder at Odess Theater. In 2010 USFS announced the Tongass Transition Framework, a plan to move away from the large scale timber industry and enhance economic opportunities in Southeast Alaska through stewardship and sustainable young growth timber harvesting. In the spring of 2013 SCS was awarded a Community Capacity and Land Stewardship (CCLS) Grant from the National Forest Foundation. The CCLS grant focuses on the use of local, young growth wood and habitat restoration. SCS used this grant to build on its established young growth utilization program. Through this current grant, SCS continued to promote regional young growth markets, incentivize forest restoration and further the Transition Framework by creating a vocational opportunity for local craftsmen that focuses on young growth timber and exploring applications. Weiland installing the locally harvested and milled red alder. 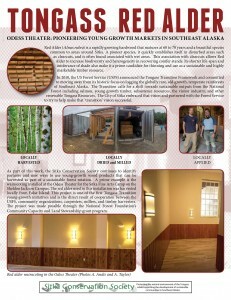 In the fall of 2013 the project was in full swing and focused on red alder. Red alder has been historically considered a ‘weed species’, however due to its abundance and growth rates, it is quickly becoming valued for use in specialty wood products, cabinetry, furniture and architectural millwork such as wainscoting or molding. SCS and the Sitka Fine Arts Camp (SFAC) partnered along with a local miller and harvester Todd Miller and carpenters Pete Weiland and Sam Scotchmer. 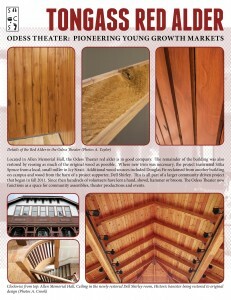 Miller harvested and processed red alder from False Island while Scotchmer, working as Weiland’s apprentice, incorporated the final product into the Odess Theater renovation project at Sheldon Jackson Campus’ Allen Hall. The result is an import substitution project featuring red alder that was locally harvested, locally dried and milled, and locally applied by skilled craftsmen. Red alder as part of the overall, volunteer driven, renovation project. Alaska Conservation Foundation supported intern Alex Crook created this video that tells the story of SCS’s 2nd growth bike shelter project. As part of the Sitka Conservation Society’s efforts, we have partnered with the Forest Service, PNW Research Labs, Sitka High School, local carpenters and millers, the National Forest Foundation, and many more, to determine effective and sustainable applications of Tongass 2nd growth resources that promotes conservation of the Tongass while also providing opportunities to use Tongass wood products. With support from the National Forest Foundation’s Community Capacity and Land Stewardship Program, SCS has initiated projects with local partners that build community assets using locally milled timber products. These projects promote sustainable harvesting of second growth timber and micro timber sales that support small, local mills. SCS tries to design projects that provide vocational opportunities for the harvest, milling, processing, and utilization of these local timber products. One such project partnered with the local high school construction course to build a bike shelter. 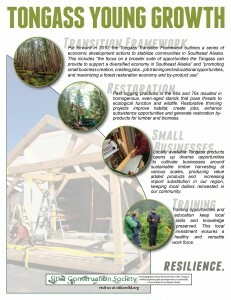 The shelter serves as a demonstration project that will be set up in a highly visible location and educate Sitkans and visitors on the story of the Tongass and second growth timber. 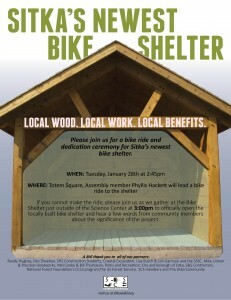 As you may recall from a previous post by Ray, a bike shelter is being built locally, using Tongass wood and will be landing at the Sitka Sound Science Center soon. I say landing, because it has been constructed at Sitka High School and will actually be transported courtesy of a sizeable fork lift and truck, thanks to S&S contractors, and placed at its final home. The shelter is a beautiful timber framed structure made of young growth Sitka spruce and old growth red cedar. Timber framing is a traditional style of building that uses non-dimensional lumber, that is, no 2”x4”s or other standard timber sizes are used in the construction of the frame. Instead, timber framed construction uses large, squared timbers and relies on carefully designed and fitted joints using wooden pegs to hold the frame in place. Not only is the bike shelter a much needed asset, it is charming in its execution thanks to the vision of Randy Hughey and newly transplanted Dan Sheehan. 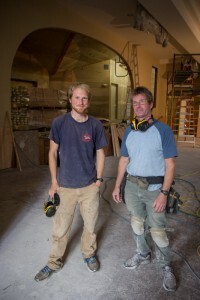 Randy, who has just retired after 30 years, has been running the Sitka High Construction and Industrial Arts courses, and Dan is an experienced timber framer. The two partnered up for this project and have since poured countless hours of their personal time into the construction of the shelter along with the help of SHS students and local volunteers. The shelter will temporarily have four U-shape racks, until the final rack is designed and installed. 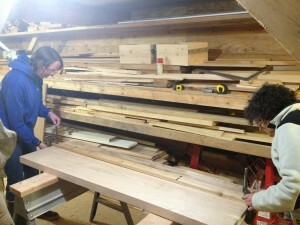 Mike Litman, of Precision Boatworks, will be designing the racks for the shelter. 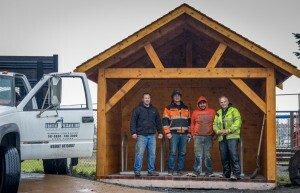 The structure joins a growing network of bike shelters around Sitka, including one being built for Pacific High School by Pat Hughes (UAS) and Pacific High students. This shelter will serve as a demonstration project, highlighting the importance of local products, local craftsmanship and knowledge, the strength of community and contributing to local economy. SCS was able to fund this project through the Community Capacity and Land Stewardship (CCLS) program with the National Forest Foundation (NFF). The goal is to share local knowledge, connect local processors with local builders, and influence resource managers to make decisions on the Tongass that benefit local communities. A sustainably managed forest will support a more resilient community. 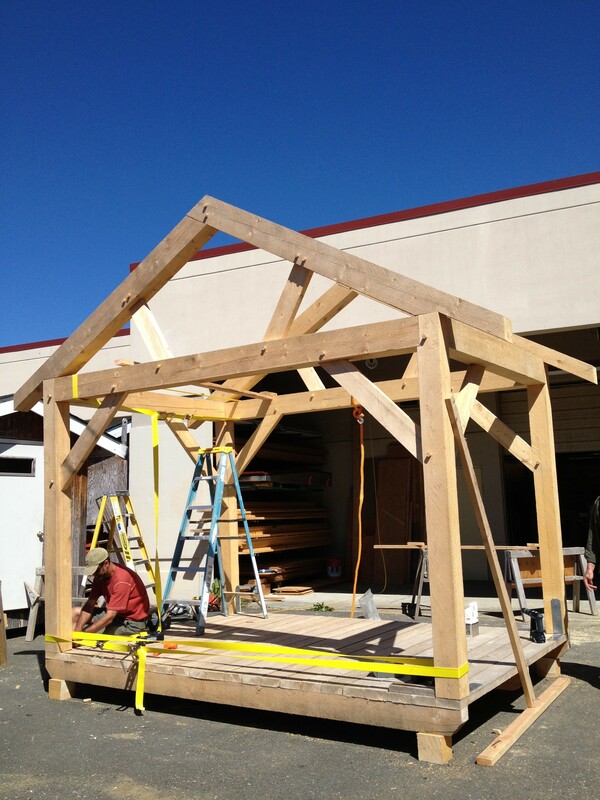 Look for the Shelter to arrive later this summer! SCS was recently awarded another Community Capacity and Land Stewardship (CCLS) Grant from the National Forest Foundation. The CCLS grant focuses on the use of local, young growth timber and habitat restoration. This grant will sustain and further develop the capacity-building momentum generated from last year’s grant. One of the components of the previous grant was to provide local, young growth timber to the Sitka High School industrial arts classes. 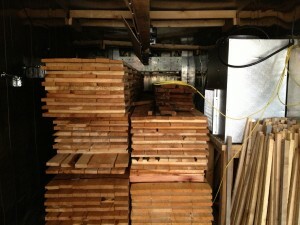 Students were provided with red alder for building bed side tables, as well as Sitka spruce to construct a bike shelter. The bike shelter will be finalized this summer and placed at the Sitka Sound Science Center. Through the current grant, SCS will continue to promote regional young growth markets, incentivize forest restoration and further the Transition Framework by creating an educational opportunity for local youth that focuses on young growth timber for structural and building applications. Currently, SCS will work with a local miller to process local red alder. Red alder has been historically considered a ‘weed species’, however due to its abundance it is quickly becoming valued for use in specialty wood products, cabinetry, furniture and architectural millwork such as wainscoting or molding. SCS is encouraging regional industry integration by building relationships between producers and users. The red alder will become part of the Allen Auditorium renovation project on the Sheldon Jackson campus. This partnership will also allow for SCS to sponsor several local high school students to work under the supervision of local builder Pete Weiland on the renovation project this summer. 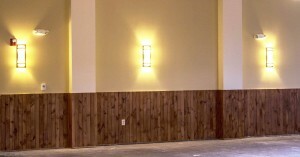 Students will be given the opportunity to spend approximately one month working on the Auditorium renovation project and will be partnered with a college mentor. The wood will be provided to the renovation project to produce an installation and demonstration project that highlights red alder as a viable material. SCS is now accepting applications from local high school students who are interested in participating in this project. Applications are due by July 1 and can be emailed to info@sitkawild.org . Jig Saws and Jack Planes and Clamps, Oh My! “You’re going to want to burn two and then mark it 13.5,” Judi says to her workshop buddy Linda. Linda carefully measures across a piece of hemlock harvested from Starrigavan Valley and marks it with a pencil. She pulls out the tape measure and goes over it again (measure twice and cut once!) as Judi confirms the pencil lines and arrows. Judi grabs the ‘worm saw’ (a powered skillsaw) and starts ripping the board as Linda holds it down and observes. After a piece of wood drops to the floor, both women carefully inspect the cut, running their fingers along the edge then nodding in approval. It’s not perfect but pretty close. “We can fix that when we sand it,” Linda says. We’ve come a long way from our first workshop class when we built our saw horses, making sure to pad the top of them with ‘sacrificial’ wood. The sacrificial wood being scrap that we don’t mind chipping, cutting and scarring as a result of our novice woodworking abilities. Our first class began with instructions from Marcel LaPerriere, local craftsman and owner of Southeast Cedar Homes. He gave us the basic DOs and DON’Ts of the wood shop as we eyed the unfamiliar gadgets and tools that surrounded us. The next few meetings we learned how to use tools, how to change drill bits and saw blades and the difference between crosscut and plane cut. Despite our rapidly growing repertoire of skills and vocabulary, we were still short on confidence, often having to encourage one another to take the helm when it was time to start up a saw. Now, class participants are confidently using saws, drill presses, and are continually awestruck all while being steeped in the delicious smell of fresh cut wood. Our class is small (eight participants) but maxes out the space in the wood shop. It is also a diverse group of women ranging from an opera singer to a retired teacher to a Sheldon Jackson summer camp organizer proficient in Chinese. 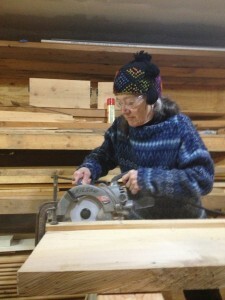 In April SCS and the Sitka Fine Arts Camp partnered to offer a ‘Women in Carpentry Workshop’. The workshop, a brain child of SCS board member Judi Lehman, and she thought it would tie in nicely with our young growth projects that were funded by the NFF Community Capacity and Land Stewardship program. The course provides locally harvested wood, tools, supplies and instruction from SCS board President Marcel LaPerriere. The product of the class is quite simple: six wooden benches to be placed at the Allen Auditorium on the SJ campus. The goal, however, is much more involved. 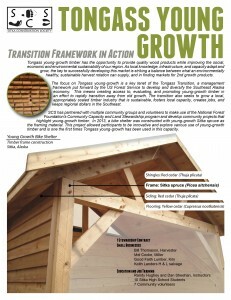 SCS wanted to showcase young growth timber, contribute to the production of a local wood product and shed light on the quality and usefulness of young-growth timber. This class takes it one step further by providing an opportunity for women who had little to no experience with wood working to learn new skills and create something for the community. One class member, Kenley, described why she decided to take the course: “I signed up because I really wanted to learn how to use power tools and wanted to gain skills for volunteering and life projects. I’ve learned so much already! The vocabulary and skills are foreign to me and I’ve reveled in learning the names of tools, techniques, and processes. I have a much deeper respect for how buildings are constructed and how wood objects are made. I’ve learned a lot about trees and wood and really appreciate Marcel’s dedication and patience in teaching this awesome class”. We aren’t quite ready to start building our dream homes, but we are learning and having fun along the way. 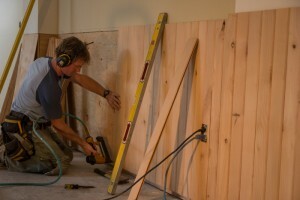 For now, I just wish I could wield a planer or skillsaw fluidly and one handed like Marcel!